The last four days I was in an isolated cabin in Clinton, Montana, with only tenuous links to the outside world. Today was the first time I was able to truly get a handle on the New Orleans disaster, and it's almost too staggering to comprehend. It's downright biblical. This is the greatest disaster to hit our nation in most of our lifetimes. Worse than 9-11. New Orleans is underwater. Biloxi is 90 percent destroyed. Who knows how many dead. Who knows how many homeless. Who knows how many jobless. We have a bona fide refugee crisis on our hands. There will be a time for a full accounting of what went wrong, both preparing for this thing and relief efforts afterward. I don't know if the time is now or later. Honestly, I don't much care. I'm too horrified by what I'm seeing today. It's overwhelming. I just wish that the president gave a damn about what's happened. 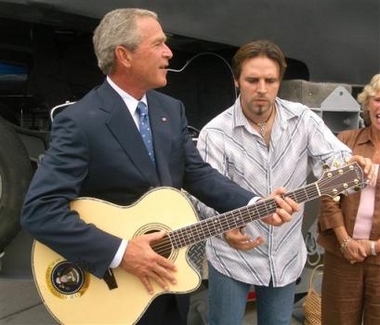 Unfortunately, he's too busy playing 'country rock star". And yeah, that photo is from today. Good to see Bush has gotten on with his life. He's gotten good at that. 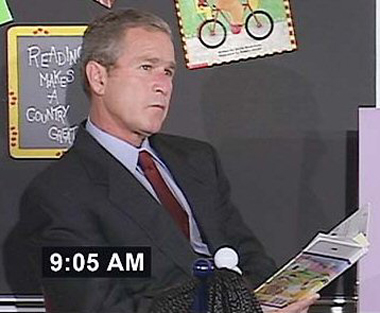 Why Did President Bush Just Sit There?